Melt butter in a medium sauce pan. Add onion and cook until tender. Drain corn (very well!) or remove fresh corn from cobs. Add corn and 1/4 cup water to butter and onions. 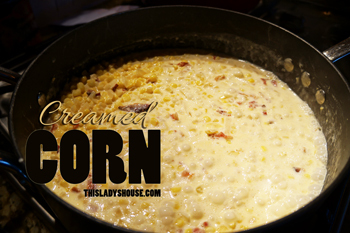 Simmer for 5-10 minutes or until corn is tender (fresh corn will take more time). Add sugar, nutmeg and cream. Cook, stirring constantly 5-6 minutes or until thick.